It is not uncommon for us to encounter problems with the spleen. Sometimes it just enlarges without any major problems, sometimes it twists on itself, sometimes it causes internal bleeding, and oftentimes it becomes cancerous. This page will emphasize cancer of the spleen, called hemangiosarcoma.. In breeds that have a high incidence of splenic tumor we recommend yearly exams starting at 5 years of age, with radiographs and ultrasounds to catch this problem early before complications and spread, since the prognosis is poor in most cancerous spleens because they have already spread by the time of diagnosis. Unfortunately, some pets, especially large breed dogs, will not show any symptoms until the spleen is huge. This occurred with a Labrador Retriever that was presented to us with the owner telling us “he just wasn’t doing right”. He was eating good, was not vomiting, had no diarrhea, and was not coughing. This owner was astute and brought him in for an exam just in case. A thorough exam and blood panel revealed no problems, so a radiograph was taken. This radiograph revealed a large abdominal mass. This could have been coming from the liver, spleen, intestines, kidneys, pancreas, or mesenteric lymph nodes. An ultrasound revealed it was from the spleen. The next day we removed an 8 pound rupturing spleen! You can see pictures of the surgery to remove this large mass in the surgery section later in this page, along with pictures of a dog with an even larger spleen! Graphic surgical photos are on this page, especially of surgery which tends to be bloody. Thrombocytopenia- a decrease in thrombocytes, which are an important part of the clotting factors when there is bleeding. The spleen is an elongated and relatively flat organ that resides in the abdomen of mammals along the outer edge of the stomach. It has a tremendous blood supply that is closely attached to the blood supply supporting the stomach. It is the largest filter of blood in the body. It has an outer capsule composed of smooth muscle and elastic fibers. The internal part of the spleen (called the parenchyma) has white pulp and red pulp. The white pulp is lymphatic tissue and the red pulp is part of the venous blood system. In between these pulps is elastic tissue that can fill up as needed. The blood supply to the spleen is closely adjoined to the stomach. You can see the dark vertical blood vessels in this photo as they enter fat between the stomach and a very enlarged and dark spleen in a semi-circle at the far right. Iron that has been recycled from old red blood cells is stored in the spleen where it awaits transport to the bone marrow. Fortunately, the body can get by without a spleen in most cases, so if there is a serious problem, and all other factors are equal, we will remove it. We tend to remove only spleens that are cancerous, rupturing, or have a torsion. Splenomegaly is a generalized term that simply means enlargement of the spleen. In some species, like ferrets, an enlarged spleen can be normal, and is called hypersplenism. A spleen can be enlarged diffusely or it might have nodules in certain areas. There are many causes for an enlarged spleen. The most common and important are listed in more detail below. Some of the more uncommon ones are due to infectious agents (erlichiosis, babesia, hemobartonella), FIP, medications, and immune mediated diseases. In this problem the spleen twists on itself, compromising the blood supply. When the spleen twists the blood keeps on pumping into it by the arterial system, but this same blood is not able to leave through the venous system, and the spleen becomes grossly engorged. It can occur on its own, after excessive exercise, or due to trauma. It can occur in conjunction with Gastric Dilatation Volvulus (GDV), also known as bloat. We tend to see this torsion, along with GDV, in large and deep chested breeds. This disease is diagnosed by imaging tests when the above symptoms are present. A radiograph might reveal a mass in the abdomen with the spleen abnormally located. Ultrasound can confirm the problem and give us an idea of its severity. 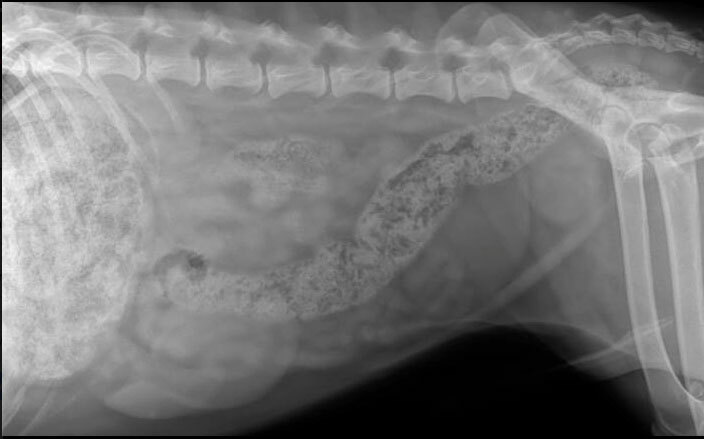 A splenic torsion is considered an emergency, so the treatment of choice is surgical removal after a pet has been stabilized by treating for shock. On the deep chested breeds we might even tack the stomach to the abdomen to help prevent potential GDV in the future. Some splenic masses that are cancerous are classified as benign, meaning they do not generally spread (metastasize), and only take up extra space within the abdomen. Even though they do not spread, sometimes this extra space they take up can interfere with other organs. Some benign cancerous masses include lipoma (fatty tumors), hemagioma (associated with vasculature), and plasmacytosis (infiltration of plasma cells throughout the splenic nodule or tissue in general). Unfortunately, when a spleen has cancer it commonly is the malignant version and not this benign version. HSA can also cause complications, such as disruption of the coagulation cascade which causes a mixture of abnormal clot formation as well as inability to control internal bleeding (known as disseminated intravascular coagulation, DIC). Symptoms of HSA vary, and range from mild to severe. In extreme cases sudden blood loss can lead to sudden death. Another common type of malignant splenic cancer is lymphosarcoma, a type of cancer that can have a primary tumor in any other organ (i.e. lung, gastrointestinal tract, liver). Lymphosarcoma is one of the more common tumor types observed in the spleen of cats. Sometimes the tumor within the spleen is not even the primary tumor, but rather a single nodule or multiple nodules due to metastasis from a distant primary tumor. Congestions of the spleen can occur from iatrogenic causes, which are those associated with administration of certain drugs (i.e. anesthetic agents or tranquilizers). Congestion can also occur due to increased blood pressure within the vasculature of the liver (known as portal hypertension), which can occur secondary to congestive heat failure among others. The spleen can over-react to particular conditions, resulting in a disease process known as hyperplastic, or reactive, splenomegaly. A spleen can become reactive when there is excessive stimulation of the immune system from conditions such as immune-mediated disease, bacterial infections, tick-borne diseases, and many more. Upon palpation of the abdomen, significant abnormalities of the spleen can usually be detected, especially when a large mass is present within the cranial aspect of the abdomen (toward the chest). However, a mass or enlarged organ in the cranial abdomen cannot always be differentiated from a mass or enlargement of the liver. In some cases, decreased pallor (pale gums) can be a sign of anemia or shock, which in combination with an abdominal mass can indicate a ruptured splenic mass or torsion. We confirm this with an ultrasound before surgery. If the gums are pale, certain diseases of the spleen may lead to free blood in the abdomen, which can sometimes but not always be detected by palpation of a fluid wave. Other generalized signs might include weakness, fever, dehydration, poor pulses, increased heart rate (tachycardia), increased bleeding at site of blood draw (due to coagulopathy), and/or increased size of peripheral lymph nodes. Some diagnostic tests which provide significant information include radiographs, blood work, ultrasonography, evaluation of the cells (cytology) through a fine-needle aspirate sample, and surgical exploration. The arrow points to what a spleen looks like on a radiograph. It is enlarged, although a lobe of the liver can easily overlap the spleen and make the spleen look enlarged. So in this case, technically its called hepatosplenomegaly. Here is a dog with an enlarged spleen. Can you see it? The red circle delineates the enlarged spleen. Blood work (clinical chemistry and complete blood counts) is a crucial component for detection of compromised organ function. Splenic involvement might reveal anemia (decreased red blood cells), thrombocytopenia (decreased platelets for clotting), leukopenia (decreased white blood cells) and reticulocytosis (increased immature red blood cells to indicate that the body is trying to compensate for the loss of mature red blood cells). This is a blood panel that might be seen with splenic disease, although many other diseases can also cause this type of blood panel. The primary problem in this blood panel is anemia. If abdominal fluid is present we can remove it and analyze it. This is called abdominocentesis. There is no guarantee this will make a diagnosis since many cancers, including HSA, might not be found in this fluid. Ultrasonography has revolutionized diagnosis in animals, and prevented many unnecessary exploratory surgeries (called celiotomies or laparotomies), while at the same time alerted us to the fact that we need to do immediate surgery. Keep in mind, our patients do not talk to us, and an enlarging tumor in the abdomen in one of us humanoids would be uncomfortable, and cause us to seek medical care long before we see a dog or cat with a tumor growing in the abdomen. Ultrasonography of the abdomen is an important modality for diagnosis of splenic disease because of its sensitivity to changes of organ size, shape, location, and even texture. An ultrasonographic examination in combination with radiographs provides a comprehensive understanding of which organs are involved and often helps to narrow the possibilities down to a select few differentials. We use ultrasound to confirm our suspicions of a splenic tumor based on the breed, history, exam findings, and blood panels and radiographs. Ultrasound confirms the diagnosis, lets us know if the spleen is already rupturing, tells us the size of the spleen, and if there are any other internal organ problems. A critical component of the ultrasonographic exam in HSA is echocardiography (evaluation of the heart). A key site of metastasis associated with hemangiosarcoma is the right atrium. HSA that has spread to the right atrium of the heart is a serious sign, and the prognosis is not good. This is important information if we are thinking of surgical removal of the spleen. Do you see the spleen in this picture without the demarcation? Aspiration of the cells in an organ for cytological exam by a pathologist is an important part of most abdominal ultrasounds. It helps prevent an exploratory surgery, and can lead to a diagnosis in many cases. Cytologic evaluation of splenic problems is not always indicated and can sometimes be contraindicated depending on certain disease processes. Certain cancers of the spleen as well as hematomas may result in significant blood loss if stuck with a needle due their fragile nature. Even though the ultrasound guides the biopsy location, if the disease process only involves a small portion of the splenic tissue, or is sporadically located throughout, then a small needle-sized sample may not obtain the affected tissue at all. Histopathology is the analysis of the spleen after it is removed. This gives us our final diagnosis. Surgery is a common treatment for splenic disease. This is called a splenectomy. If there is trauma or a problem in only a small part of the spleen, we might do a partial splenectomy since we always want to preserve as much function of the spleen as possible. This partial splenectomy is not common. We do the surgery to remove the tumor, and if malignant add chemotherapy to help prevent spread after we do the surgery. Prior to surgery we do an ultrasound of the heart as already mentioned, and also take chest radiographs to check for spread of a tumor. We also perform a clotting panel since blood loss is common in this surgery and we do not want post operative bleeding. Unfortunately, survival time for dogs and cats with surgery alonge HSA is only 1-3 months, with most dogs dying due to spread of the HSA to other organs, causing these organs to malfunction. This emphasizes the need for an early diagnosis in the breeds prone to this cancer. Dogs that have surgery to remove the spleen, and that are also treated with chemotherapy, might survive up to 9 months. This depends on whether the tumor has spread, and again emphasizes the need for an early diagnosis. Dogs and cats have less side effects than people on chemotherapy, and their quality of life is high if this therapy is instituted immediately after surgery. Dogs that are diagnosed at a young age, have had the HSA rupture prior to surgery, have evidence of spread to other organs when the splenectomy is performed, or have a more aggressive grade of tumor, do not tend to live 9 months after surgery. The primary chemotherapy drug for HSA is Adriamycin (doxorubicin). It will slow the disease process, but it will not cure your pet of this disease. The doctors at the Veterinary Cancer Group in Tustin institute this therapy. If a pet is anemic, or we anticipate significant blood loss during surgery, we will give a blood transfusion prior to surgery or during the procedure. Post operatively if a pet is not doing well we will give a blood transfusion also. A splenectomy is performed to treat and sometimes cure this problem. It is sometimes done as an emergency procedure if the spleen has ruptured and there is significant internal bleeding. Pre-anesthetic preparation is important in every surgery we perform, no matter how routine, because surgery is not an area to cut corners. Once a pet is anesthetized, prepared for surgery, and had its monitoring equipment hooked up and reading accurately, the surgery can begin. While our patient is being anesthetized our surgeon is already in our surgical suite setting up instruments. Our surgeon is ready to start before our patient is at a proper plane of anesthesia. Once the anesthetist gives the green light the surgery starts immediately. We want our surgeon waiting for his patient, not the other way around. All of this is to minimize anesthetic time. In addition to our monitoring equipment our anesthetist stays “hands on” in monitoring important physiologic parameters. In addition to our monitoring equipment our anesthetist stays “hands on” in monitoring important physiologic parameters. Our anesthetist is using a special stethoscope (esophageal), that is passed down the esophagus and lays right over the heart. This gives us a clear sound of the heart and how it is beating. To minimize anesthetic time we routinely have 2 doctors working as a team performing the splenectomy. They work together as a well orchestrated team.Our patient is under anesthesia and our surgeons are completing the draping process while our anesthetist is adjusting the surgical lights. By working together early in the surgery we minimize anesthetic time. For a pet that might already be anemic it is important to minimize blood loss during surgery. Special care is taken on entering the abdomen to minimize loss. There is minimal bleeding at this point as our surgeon gently dissects the sub Q (subcutaneous) tissue just under the skin. As the surgery progresses we sometimes encounter significant bleeding from blood vessels in the sub Q fat and from muscles that are cut. All of them are clamped or cauterized before proceeding further. For a pet that might already be anemic this added blood loss is important to control, and it is stopped immediately. When all bleeders are under control (called hemostasis) we enter the abdomen. We make our incision at a specific spot in the abdominal muscles called the linea alba. It is at this spot that there are minimal blood vessels. The linea also has strong tendinous attachments to the muscle, so when we sew it back together these tendons attachments have more holding ability than the abdominal muscles alone. This will prevent a hernia. Our first view of the spleen once we have entered the abdomen. It is the round and reddish structure at the top of the abdominal opening and just to the left of our surgeon’s finger. A spleen that is not healthy is friable and can easily rupture when handled. Our surgeon has to gently coax it out to prevent this from happening. Once it is finally exteriorized the problem is obvious. At this point we do not know if it is cancerous or not. We do know it is in the process of rupturing and glad we are getting it out now. Now that we have it ready for removal we have to ligate its blood supply. As you remember from your surgical anatomy above the blood vessels to the spleen are closely related stomach. It is important to ligate the blood supply very close to the spleen so as not to compromise the blood supply to the stomach, leading to serious consequences. This blood supply can be surrounded by fat. We have to isolate segments before we ligate. In the center of this picture you can see one blood vessel that is already ligated. On the right our surgeon is in the process of ligating another blood vessel. We have completed 3 ligations at this point, with many more to go. Our surgeons work simultaneously, each starting at a different end of the spleen, so they can complete this tedious part of the surgery sooner. Its all about secure ligation of these blood vessels and minimal anesthetic time. As part of the natural healing process there is a tissue in the abdomen called omentum. It is like a net, and surrounds an organ that might be diseased. For example, a ruptured intestine that is leaking intestinal fluid (extremely irritating to the abdomen and will cause a peritonitis), will have this net surround the intestine to wall off the leak. In the case of this rupturing spleen the omentum covered the spleen to help prevent further blood loss. These are clots on the omentum from that. At this point in time during the surgery we cannot determine for sure if these are clots or spread of tumor. The report from the pathologist will tell us for sure. It turns out that this time they are clots. When the spleen is completely removed we complete our exploratory surgery by checking the other internal organs, especially the liver. Once this check is complete we suture the muscle layer (the linea alba) closed. Again, we work as a team, with each surgeon (they are both lefties) suturing the linea until they meet in the center. Once we have finished suturing our patient, who is already on a pain patch (Duragesic or Fentanyl patch- which is removed in 3 days), is given an additional pain injection and carefully monitored post-operatively. As part of the monitoring we perform a simple blood panel to make sure there was no problem with blood loss during surgery. If the blood loss is significant we will give a blood transfusion with the blood we have already set aside specifically for this patient. Post operatively we take radiographs of the chest and perform and ultrasound every 2 months for cases of HSA looking for distant and local metastasis. Occasionally we come across a spleen that is so large it is hard to believe it can get this big. The following spleen was over 8 pounds, removed for a 65 pound labrador named Jake. Dr. P and Dr. R had to do this one together. Removing it was like delivering a baby! The size was obvious as soon as we entered the abdomen. At this point in time we were not sure if it was a boy or a girl! Dr. P is coaxing it out of the abdomen at the beginning of the surgery, being very careful not to rupture it. It turns out that this was a hematoma and the dog did fine for several more years. Lucky this spleen did not rupture before the surgery. Most likely, with a hematoma this large, death would have ensued rapidly. You can learn all the details of this case, and see his surgery, by following this Had to make it live for you to see it. spleen hematoma link. Its a case study and very informative, with lots of cool pictures. A successful outcome from surgery depends on what disease process is present and how long it has been present. Hemangiosarcoma – guarded to poor.